This page lists ‘proper’ scientific publications. For writing published elsewhere, including online, see the journalism and popular medicine pages. Bury RF. Radiology: A practical guide, Oxford: Oxford University Press, 1988. Bury B and Fowler R. Imaging strategy: a guide for clinicians, Oxford: Oxford University Press, 1992. 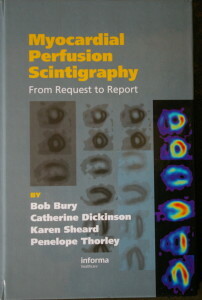 Bury B, Dickinson C, Sheard K, Thorley P. Myocardial Perfusion Scintigraphy: From Request To Report. Taylor & Francis Ltd (United Kingdom), 2007. Image quality: a clinical perspective. In: Assurance of quality in the diagnostic imaging department; Ed. Finch et al; London, British Institute of Radiology, 2001. The solitary thyroid nodule. In: Clinical Nuclear Medicine, Ed. Professor M Peters. Martin Dunitz (London) 2003; 651-657. Radionuclide imaging in: Medical Imaging and Radiation Protection, Ed.Martin, Dendy & Corbett. British Institute of Radiology 2003; 47 – 57. 1. Use of radiation in patients who might be pregnant: we go to considerable lengths to ensure that ionising radiation is only used where the clinical benefits outweigh the small risk of inducing cancer in the irradiated tissue. In female patients of childbearing age, it’s also important to make sure that we don’t inadvertently irradiate any foetus which might be present. I represented the Royal College of Radiologists in drawing up this guidance. 2. I also co-authored this public information leaflet on radiation hazards. Bury B. Patients and radiation – an assessment of the risks. Journal of the Royal College of General Practitioners 1984; 34: 296-297. Bloodworth LL, Stevens PE, Bury RF, Arm JP, Rainford DJ. Emphysematous gastritis after acute pancreatitis. Gut 1987; 28: 900-902. Bury RF, Evans DC, Divers AR, Trewhella MJ. Oesophageal atresia – antenatal diagnosis and immediate postnatal management. Journal of Obstetrics and Gynaecology 1987; 8: 142. Bury RF. The radiological investigation of impotence. British Journal of Sexual Medicine 1988; 15: 30-33. Bury RF. Bone scintigraphy in the evaluation of ejection injuries. Aviation, Space and Environmental Medicine 1989; 60:(7 Suppl.)A16-17. Bury RF. General practice radiology – the poor relation. Clinical Radiology 1990; 42: 226-27. Bury RF, Smith AH. Out-of-hours scintigraphy: a survey of current practice. Nuclear Medicine Communications 1993; 14: 126-29. Bury B, Hufton A, Adams J. Radiation and women of childbearing potential (Editorial). British Medical Journal 1995; 310: 1022-23. Bury B. 28 day rules – OK? (editorial). Radiography 1995; 1: 9-11. Davies AG, Cowen AR, Fowler RC, Bury RF, Parkin GJS, Lintott DJ, Martinez D, Saifuddin A. Spatial resolution requirements for softcopy reporting in digital radiography. Proc. SPIE 1996; 2707: 334-343. Davies AG, Cowen AR, Parkin GJS, Bury RF. Optimizing processing and presentation in PPCR imaging. Proc. SPIE medical imaging 1996; 2712: 189-195. O’Connor PJ, Davies AG, Fowler RC, Lintott DJ, Bury RF, Parkin GJ, Martinez D, Saifuddin A, Cowen AR. Reporting requirements for skeletal digital radiography: comparison of softcopy and hard-copy presentation. Radiology 1998; 207(1): 249-254. Naik KS, Bury RF. Imaging the thyroid. Clinical Radiology 1998; 53: 630-639. Bury RF, Cowen AR, Davies AG, Baker EL, Hawkridge P, Bruijns AJC and Reitsma H. Initial experiences with an experimental solid-state universal digital X-ray image detector. Clinical Radiology 1998; 53: 923-928. Bury RF. Radionuclide Radiology. Clinical Radiology 1999; 54(3): 139.
of an experimental flat dynamic x-ray image detector system. SPIE Proc Phys Med Imaging 1999;3659: 324e35. Bury RF, Cowen AR, Davies AG, Hawkridge P, Bruijns AJC, von Reth E. Initial technical and clinical evaluation of a new universal image receptor system. European Radiology 2000; 10: 1983-1987. Bury RF. The new ionising radiation regulations – will they make a difference? Imaging 2000; 12: 255-261. Launders JH, Cowen AR, Bury RF and Hawkridge P. Towards image quality, beam energy and effective dose optimization in digital thoracic radiography. European Radiology 2001; 11(5): 870-875. Carmichael AR, Johnston D, Barker MCJ, Bury RF, Boyce J and Sue-Ling H. Gastric emptying after a new, more physiological anti-obesity operation: the Magenstrasse and Mill procedure. European Journal of Nuclear Medicine 2001; 28, No 9: 1379 – 1383. Davis AG, Cowen AR, Kengyelics SM, Bury RF, Bruijns TJ. Threshold contrast detail detectability measurement of the fluoroscopic image quality of a dynamic solid-state digital x-ray image detector. Medical Physics 2001; 28(1): 11-15. Bury R F. Radiation hazards in urological practice. BJU International 2002; 89: 505-509. Bury R F. Commentary on: Does reporting of plain chest radiographs affect the immediate management of patients admitted to a medical assessment unit? Clinical Radiology 2003; 58:717-718. Bury B. Commentary: How to synthesize evidence for imaging guidelines. Clinical Radiology 2004; 59: 62. Bury B. Commentary: X-ray dose training: are we exposed to enough? Clinical Radiology 2004; 59:926-927.